We had a particularly interesting discussion centred on question three. 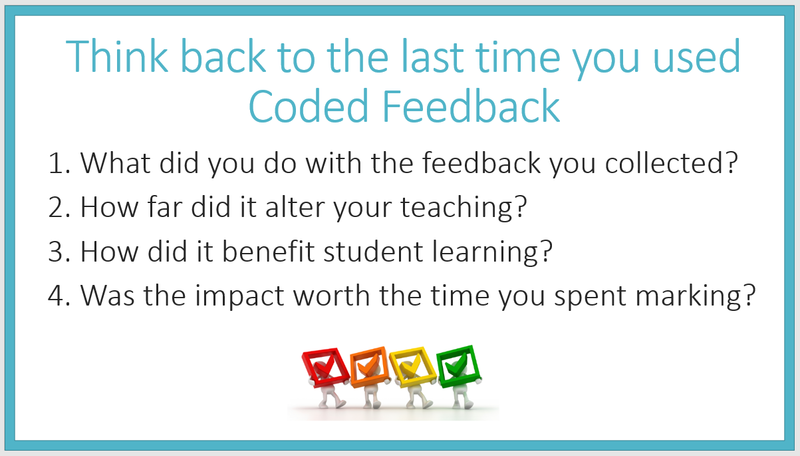 Colleagues identified coded feedback as more effective with KS3 and KS5 than with KS4, and this seemed to be the case across a range of subjects. Digging deeper, a common theme emerged that the skills expected of students at GCSE are much vaster than those at KS3 and KS5. Departments were therefore finding it more difficult to implement feedback immediately after a piece of work as time constraints haven’t allowed real time to be invested in one skill before moving on to the next. In contrast, colleagues identified KS5 as the key stage they were finding coded feedback most effective, mostly as the skills required of students were more similar but also students could approach their areas of improvement with more maturity. Colleagues had seen improvement in specific areas of development given to students through coded feedback at KS5, especially when students were asked to write their previous target at the top of their next piece of work. When evaluating coded feedback against other types of feedback, it became clear that coded feedback has its place and can be extremely effective when used at appropriate times. Mostly, colleagues have been using coded feedback for bigger pieces of work which required more detailed and diagnostic comments on students work. In other circumstances, such as homework and classwork, the effectiveness of coded feedback was limited as the nature of the task wasn’t seen as important by students, and therefore the process was not engaged to such a high level. It was also discussed that verbal feedback is the most common kind of feedback given to students as it is immediate, directed and quickly responded to. However, in relation to all of the questions asked previously, coded feedback was seen as more effective than written comments in all respects. Coding comments makes feedback easier to record, by grouping students teaching is easier to adapt to meet the needs of all learners, students have very clear instructions on how to improve and the time spent on feedback is spent more on planning feedback activities than writing comments.